The progress and promise of the Second Ward began its realization during the 1870s. In January of 1871, it was reported that the East Side had experienced $195,400 in new construction, in spite of the problems just getting up the darn hills! Eau Claire Lumber Company began grading the hill up Eau Claire Street, and by July of 1873, the University Square area was becoming one of Eau Claire’s “most beautiful and important suburbs.” The Eau Claire River bank was narrowed with material taken from deepening the channel, and the addition beyond University Square was surveyed and platted. Both Kelsey (Grand Avenue) and Gibson Streets were graded, and by 1881 a building boom on the hill was noted in the newspaper. At this time the Second Ward boasted 13 businesses. 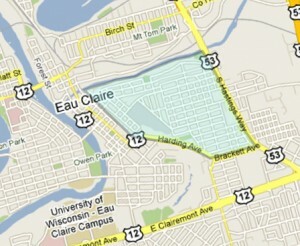 That same year the Eau Claire Street hill was improved, and by 1883 land for an elementary school was purchased. The East Hill was truly becoming a cohesive neighborhood. In an effort to link the Second Ward with the Near North Side, a pedestrian bridge was constructed over the Eau Claire River in 1889. Businesses on both sides of the river enjoyed the new found customers who could now cross from one neighborhood to the other. Unfortunately, the bridge collapsed in 1893, but in 1911, the School Board purchased land for a playground for the Second Ward School. Once again, the need for a footbridge became a neighborhood focus. So a new footbridge was constructed across the top of the old water mill dam in 1912. Once more, the two neighborhoods could share their businesses, and the children of both neighborhoods could also share the Boyd Park Playground. Improvements to the neighborhood continued. By 1917, Boyd School, which replaced the original Second Ward School, was considered to be the finest in the city. 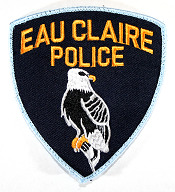 The Eau Claire River, near the footbridge, was used as a bathing beach for many years. By 1925, the city decided to extend East Grand Avenue through Boyd Park to Summer Street. This once again improved access and people who worked at the Gillette Tire Company on the north side of the river began parking on the south side and walking across the footbridge to work. In spite of the Depression, progress in the East Hill Neighborhood continued. A new addition to Boyd School increased its capacity by 70 students, and the Gray Street hill was finally graded and opened to traffic. Retaining walls were needed for Boyd Park and a large quantity of Dunnville sandstone, taken from some razed buildings in Shawtown, were used. Walter’s Brewery donated stones from an old brewery building foundation to finish the Boyd Park wall. That same year, NSP gave the city land along the Eau Claire River from Summer to Margaret Streets. 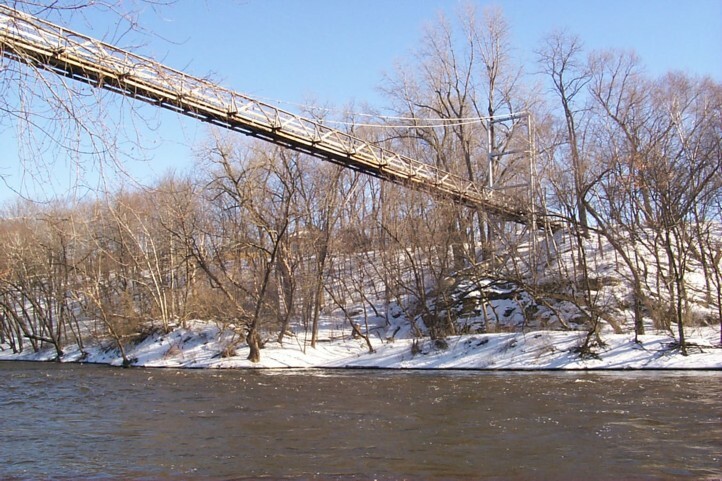 By this time, the 1912 footbridge needed to be replaced, and Hoeppner- Bartlett, an East Hill business, was awarded the new footbridge contract. In 1933, the Second Ward bathhouses were moved because of the new footbridge. The new bathhouse had concrete floors and toilets and was a vast improvement over previous ones. Health concerns finally closed the swimming beach in 1936, but the bridge continued to be used heavily by pedestrians from both neighborhoods going to and from work, walking to businesses on either side of the river, and by children and families who used the Boyd Park Playground. This use of the footbridge continues even now. Children are still drawn to Boyd Park for the ball field and various summer activities, as well as the skating rink maintained by the City of Eau Claire each winter. 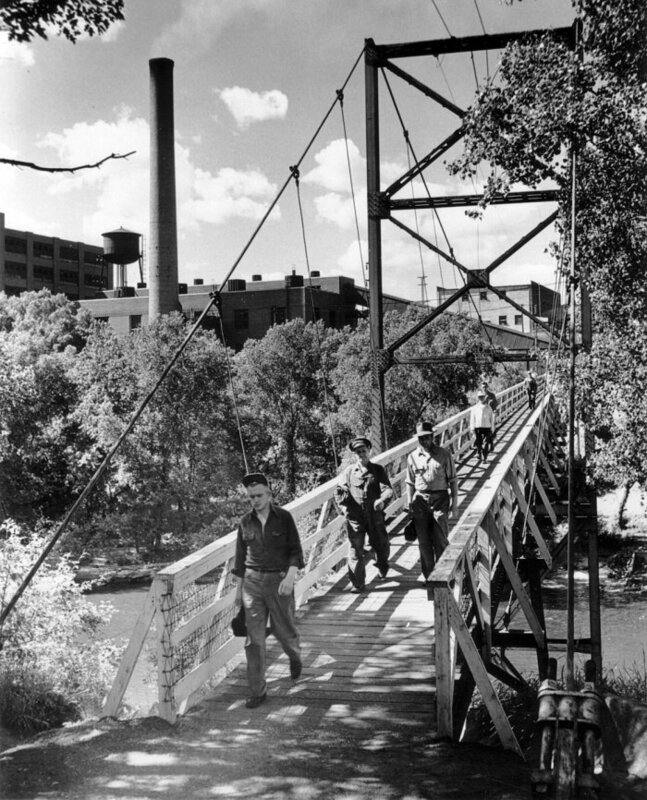 The footbridge, once used as an artery for people working at the Gillette Tire Company, and later at the Uniroyal plant, is still used for that purpose. Many people walk across the bridge just to experience the scenic beauty of the Eau Claire River gorge. The history of the pedestrian bridges linking the Near North Side Neighborhood with the East Hill Neighborhood spans over 100 years, and in the past, people have always found a way to continue that tradition. Note: The photo (from Bridgemeister.com) shown at the top is, of course, outdated as the bridge has been rebuilt.